Country Music People reviews Anna's new CD, Countrypolitan Duets and gives it a four-star rating! Wilson taps into Nashville’s so-called “Countrypolitan” era with the help of past and present country stars and two contemporary jazz giants. She gives a big band treatment to “Walkin’ After Midnight,” featuring the Grammy-winning trio Lady Antebellum. Wilson explains that Countrypolitan is rooted in “The Nashville Sound,” a style introduced in the late 1950s by artists like Jim Reeves, Patsy Cline and Eddie Arnold. Released Tuesday, this disc is a fascinating experiment: Can a Nashville-based jazz singer such as Anna Wilson successfully create an unlikely marriage between country, jazz, and pop? The answer is a resounding yes, a testament to Wilson's immense capabilities as a diva and music visionary/interpreter. There's a lot of good ol', down-home swing, but it's mostly a collection of lush duets and ballad-like covers in which Wilson is paired with some equally fine singers and groups, from American Idol finalist Matt Giraud to Ray Price, Keith Urban, Lady Antebellum, Ray Price, Rascal Flatts, Rick Braun, and Kenny Rogers. You can hear the sultry jazz, the impassioned country -- but, by whatever name, the common denominator is romance and lots of it. Songs covered include hits from Patsy Cline, Price, and others. ...Here's something a bit different, however. The artist I'm profiling today is rooted pretty firmly in the world of jazz--indeed, she is being called the "new Norah Jones" by some, and she topped the iTunes jazz chart last December with a collaboration featuring 2009 American Idol finalist Matt Giraud. Drawing inspiration from “That Nashville Sound” of the late 1950s and 60s when country music began incorporating the sounds of mainstream pop, Nashville-based singer/songwriter Anna Wilson’s latest project blends classic country and jazz through duets with stars from both genres. No matter how far contemporary country music wanders from its traditional roots, its leading stars almost always cherish a chance to sing an old-time country standard. Anna Wilson, a popular jazz-influenced vocalist based in Nashville, offers a new twist on that classic theme: She and several Nashville stars, and a few legendary figures, team up for jazzed-up takes on well-known tunes. Wilson's "Countrypolitan Duets" highlights tasteful, lounge-style arrangements, lush with strings, tinkling piano keys, brushed drums, and the occasional brassy, Ray Charles-style finger-snapper. The members of Lady Antebellum provide harmonies on a swinging "Walkin' After Midnight"; a B3-organ and fat-note guitar set a smoky atmosphere for Keith Urban's duet on "Good Time Charlie's Got The Blues"; and Kenny Rogers trades verses on a playful version of "For The Good Times," which slides from a piano-and-guitar ballad to a strings-and-brass show stopper. Wilson has a full-toned, honeyed voice reminiscent of a 1950s pop-jazz singer like Rosemary Clooney, and she toys with tempo and phrasing like the superb pros of yesteryear. Nothing here is as challenging as Cassandra Wilson's artful deconstructions of classic American songs; but for those who miss Bing, Frank and Ella and the debonair way they could swing a well-written composition, Wilson has gift-wrapped a Southern-styled present for you. CHECK OUT THIS TRACK: Of all of country music's Hall of Fame-level legends, Ray Price has always owned the greatest jazz chops, in his range, his well-tempered tone and his masterful phrasing. His duet with Wilson on his hit, "You're The Best Thing That Ever Happened To Me," is the album's standout track, uplifted by harmonies from the members of Rascal Flatts; the band members sound like they would fit on a Mel Torme album. 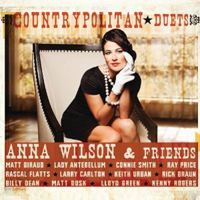 Countrypolitan Duets finds pop-country songwriter and occasional jazz singer Anna Wilson joined by an all-star roster of current country A-listers and genre legends, along with some big-name jazz performers, covering some classic country songs in the context of lush, gently swinging arrangements. Wilson is a fine vocalist, with a smooth, perfectly controlled soprano that lends itself well to performing pop standards. While many of the best country singers are those with distinctive, soulful senses of phrasing, Wilson's voice is crisp and pretty, and it's well-suited to the big-band and smooth-jazz arrangements she's crafted here.